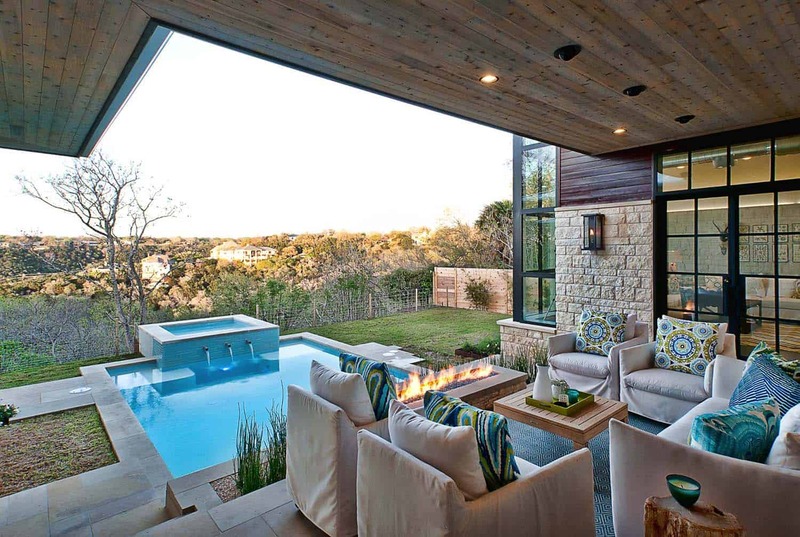 This gorgeous Hill Country modern home was designed by Cornerstone Architects in collaboration with Glynis Wood Interiors, located in Austin, Texas. 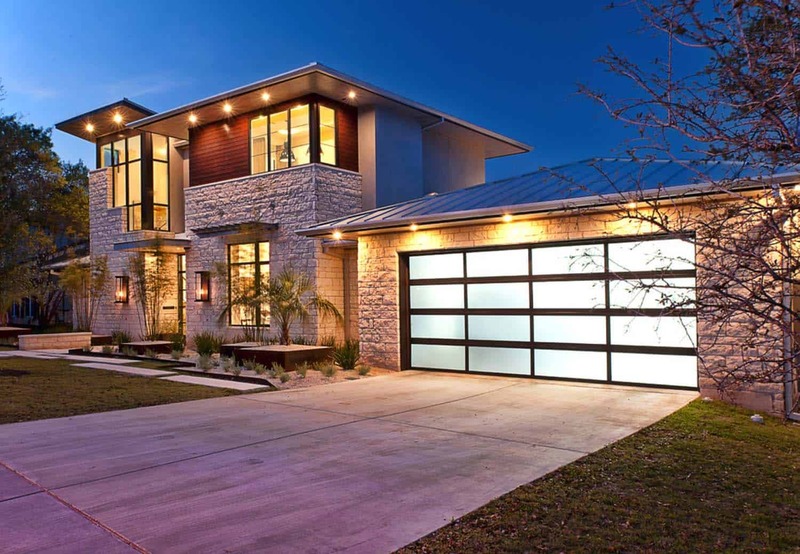 The residence is sited in Cat Mountain, an affluent neighborhood in the hills of northwest Austin, offering views of Lake Austin and the Colorado River. A remodel and addition project, structural considerations required for an extensive tear down of the original home. 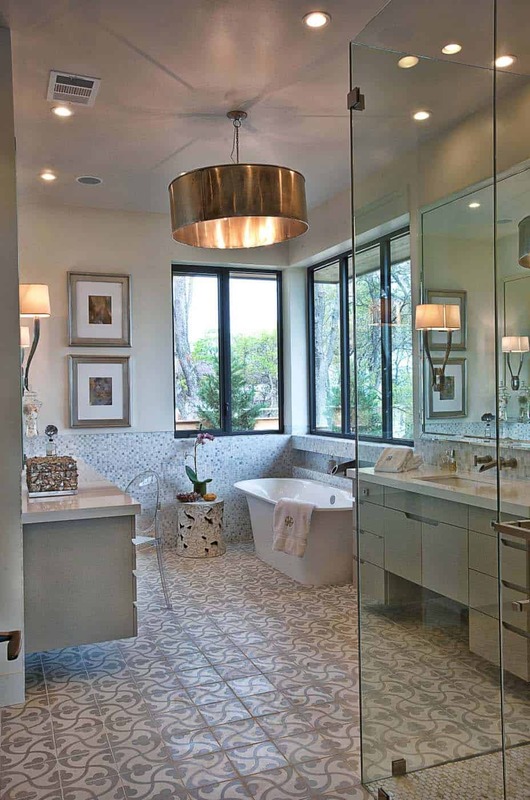 The homeowners requested that the remodel design be kept intact, where much of the existing home was re-created. 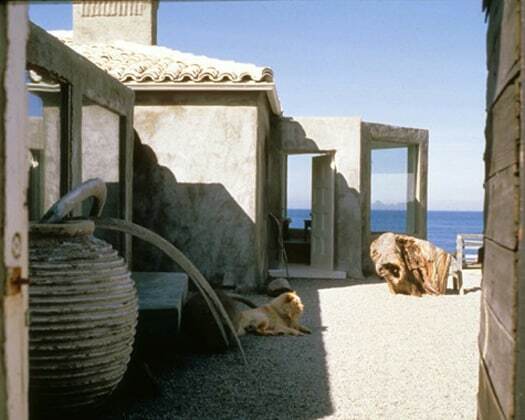 The overall floor plan layout was designed to maximize the views surrounding the home. 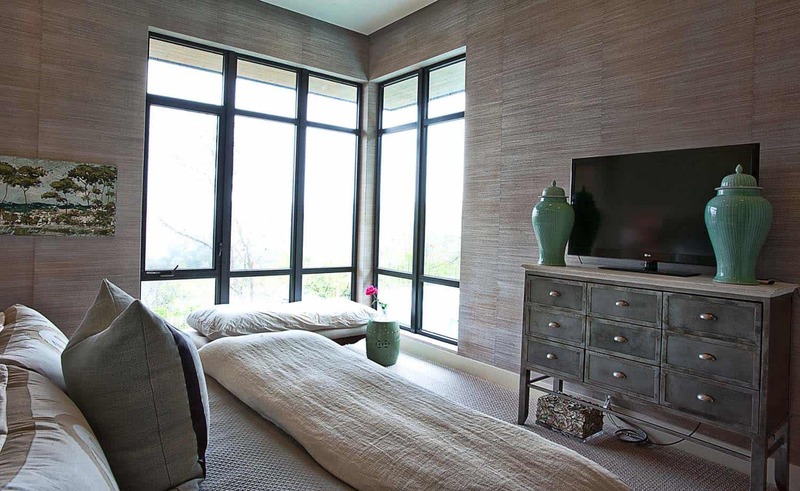 Expansive windows were carefully placed to capture and enhance the views. 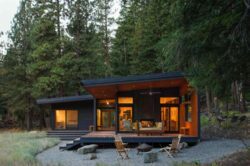 The 4,123 square foot dwelling opens to the outdoor living area, blurring the boundaries between indoors and out. 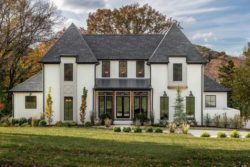 The homeowner, who also specializes in residential interiors, had a vision of ‘transitional’ style for the home, marrying clean and contemporary elements with touches of antique charm. 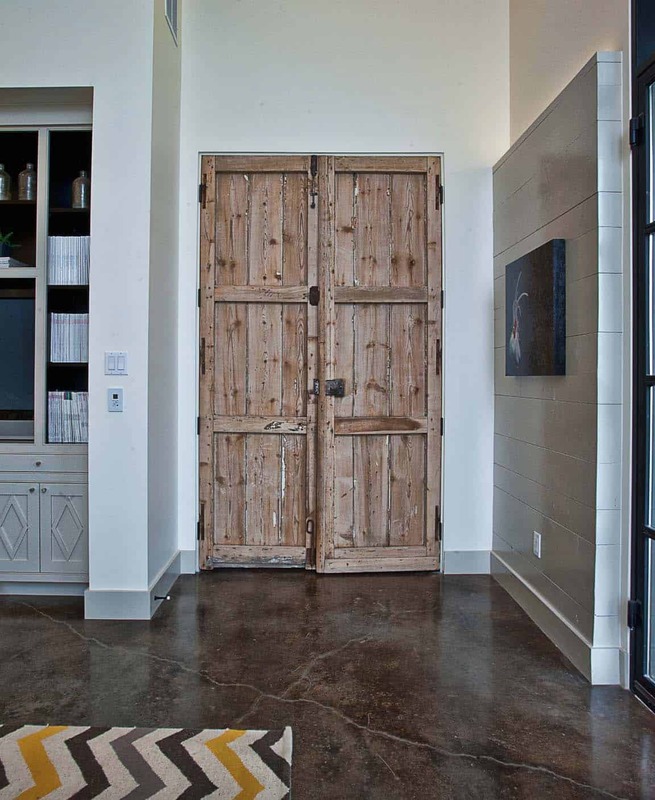 Energy-efficient materials along with reclaimed architectural wood details were seamlessly integrated, adding sustainable design elements to this transitional design. 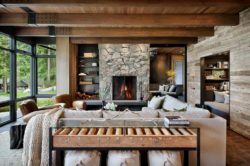 A collaborative effort between architect and homeowner, the overall aesthetic is characterized by modern, clean spaces playfully interjecting rustic elements. 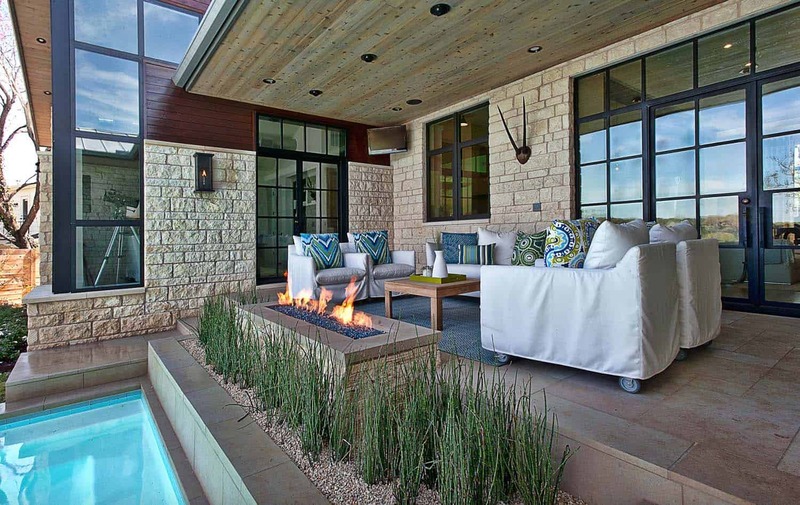 What We Love: This Texas Hill Country modern home is one of the most beautiful home tours we have featured here on One Kindesign. 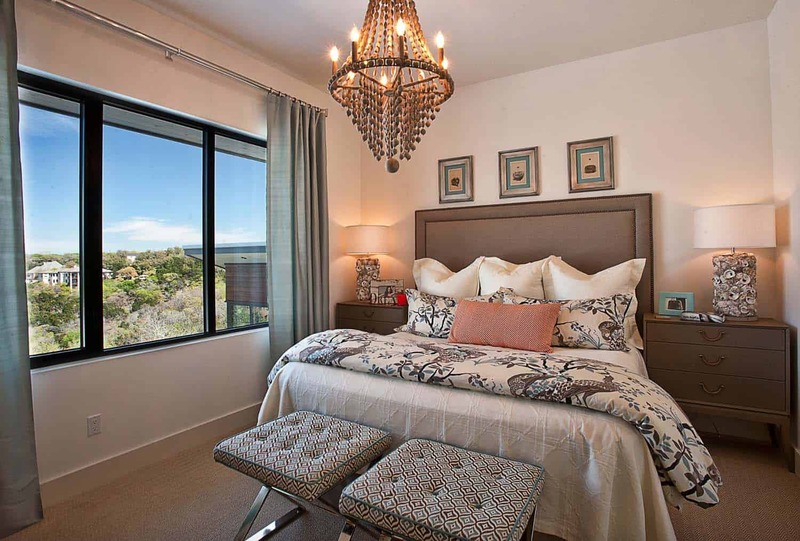 The interiors are warm and inviting with a soothing color palette and stylish furnishings, fixtures and accessories. 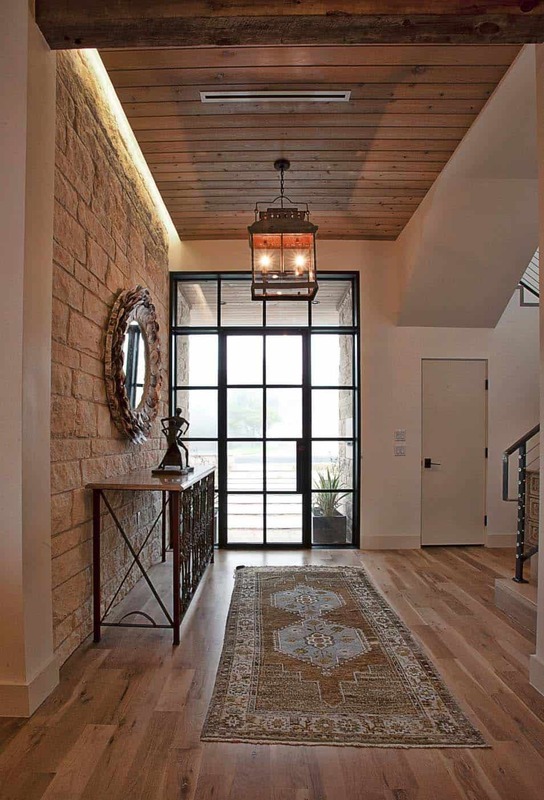 There is plenty of design inspiration throughout, with so much attention to detail… love the refinish of the hickory wood floors! 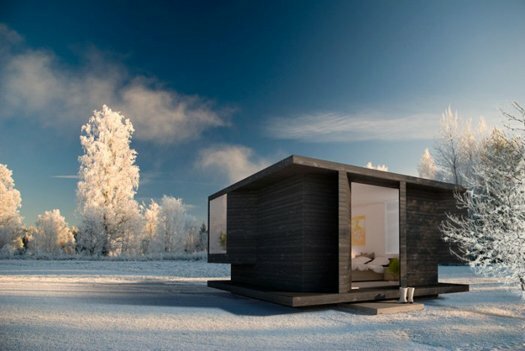 Readers, what do you think of the design of this home? 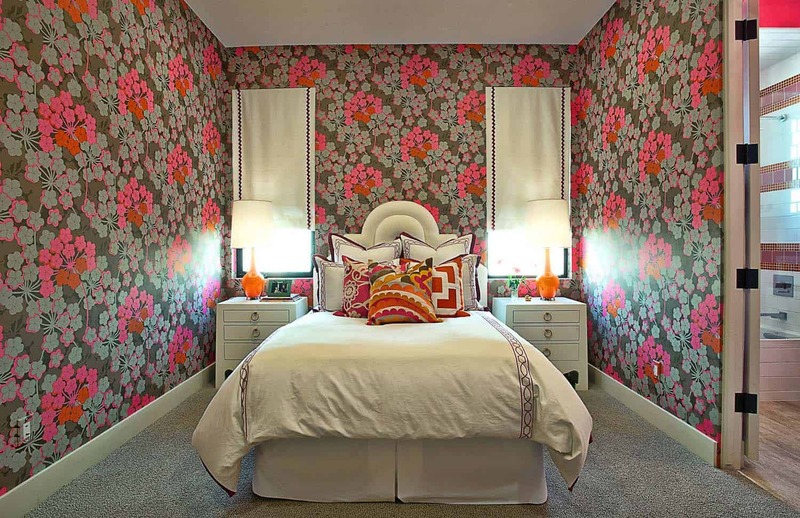 Is this one of your favorite home tours? Tell us why or why not in the Comments below! 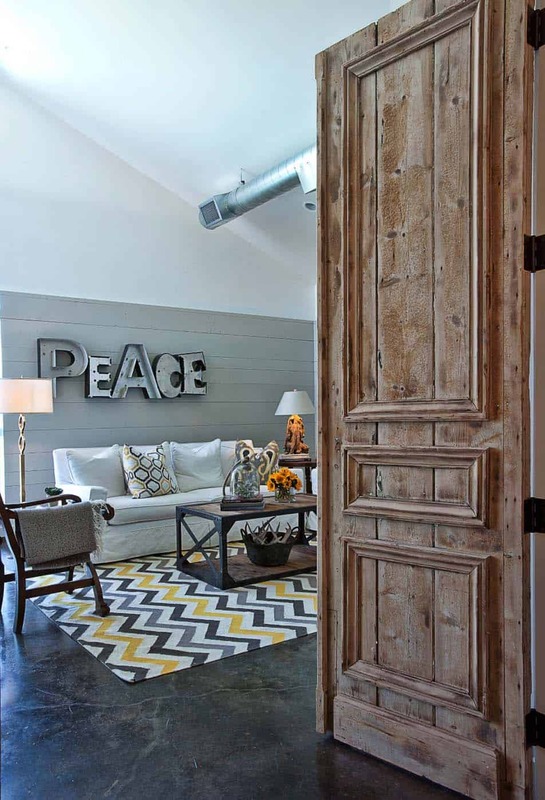 Above: The front door is from Forjas Designs in a flat black. Cladding the entry wall is rough cut limestone. 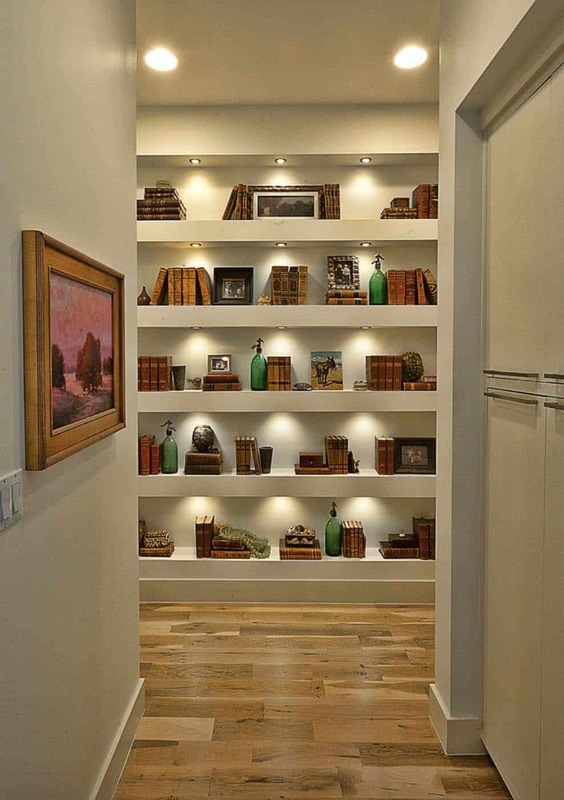 The lighting throughout the interiors of this home is from one of two places: Lights Fantastic or Objects. 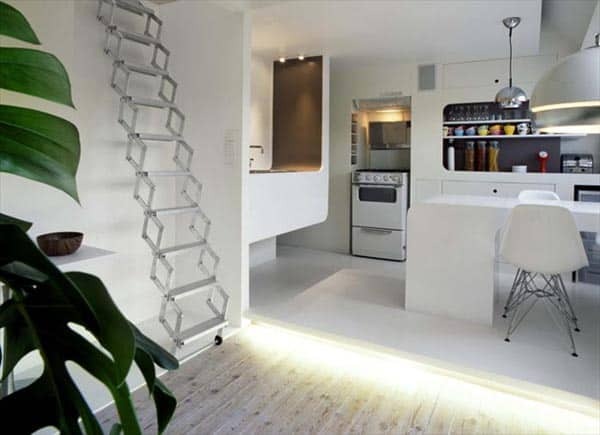 The strip lighting (above) is just a recessed fixture in a lighting cove. Above: The piece of blue artwork to the right is by Kathryn Goodnite Fine Art. Walls are painted in White Cloud 2159-70 | Benjamin Moore, serving as the perfect backdrop for the homeowners beautiful art collection. 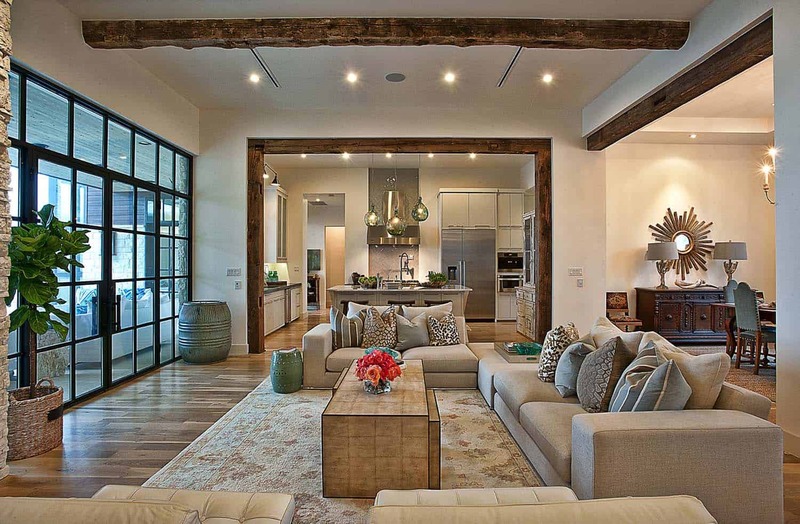 The dining room is approximately 16’x12′, while the living room is approximately 22’x19′. The ceilings are 12-feet high. 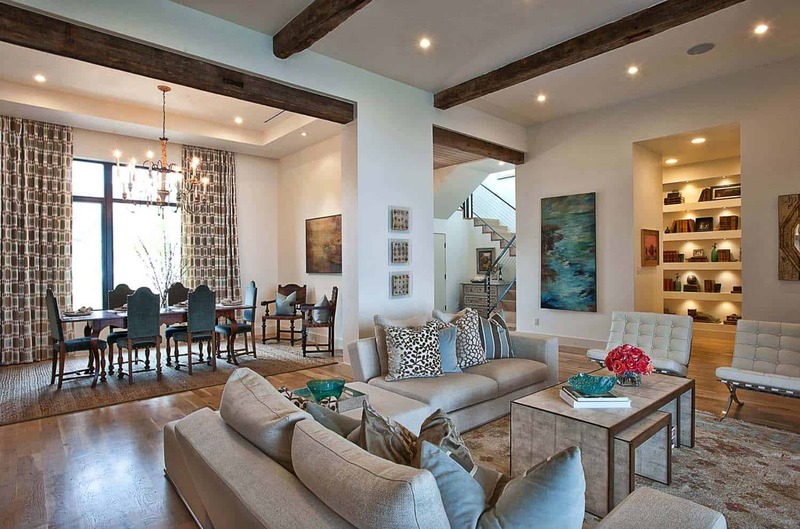 On the ceiling are 8″ x 8″ decorative wood beams that match the reclaimed wood columns in this home. 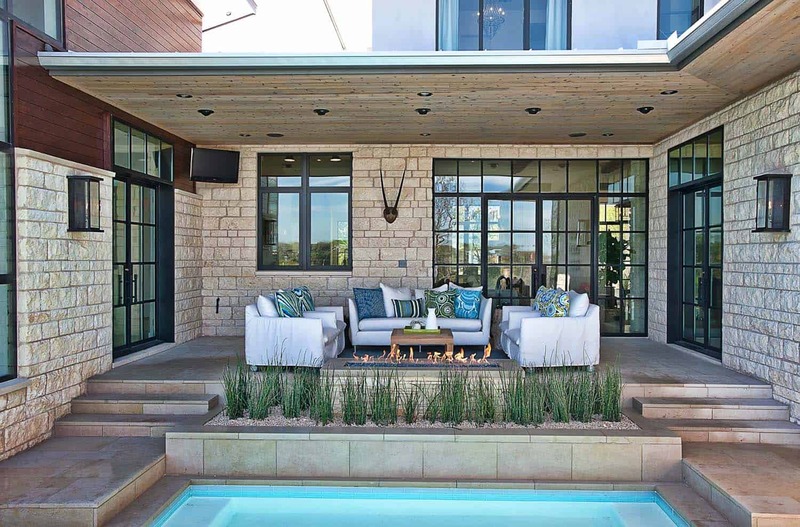 Above: The windows are from Texas Custom Windows, while the doors are from Forjas Designs. Above: In the living room, the sofa by Lytle Pressley offers supreme comfort and mixes well with the stylish Barcelona chairs. The Avedon Coffee Table is by Dwell Studios from LOFT home in Austin, Texas. The fireplace stone was hand cut on site. 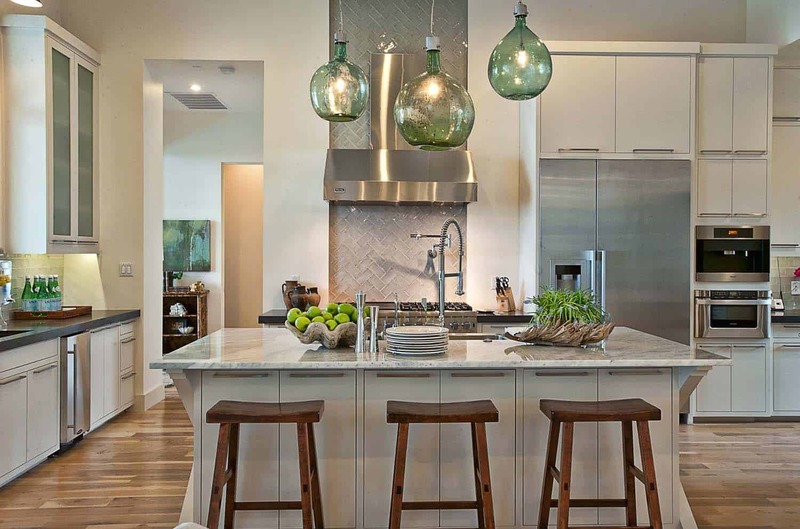 Above: The pendant lights over the island are the Bobo Intriguing Objects Wine Spheres, sourced from LOFT. 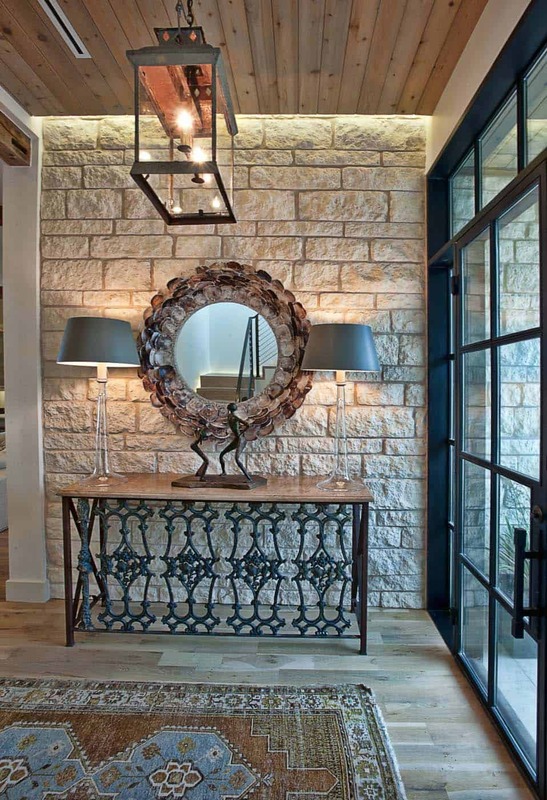 A similar light fixture can also be found on Cisco Home. 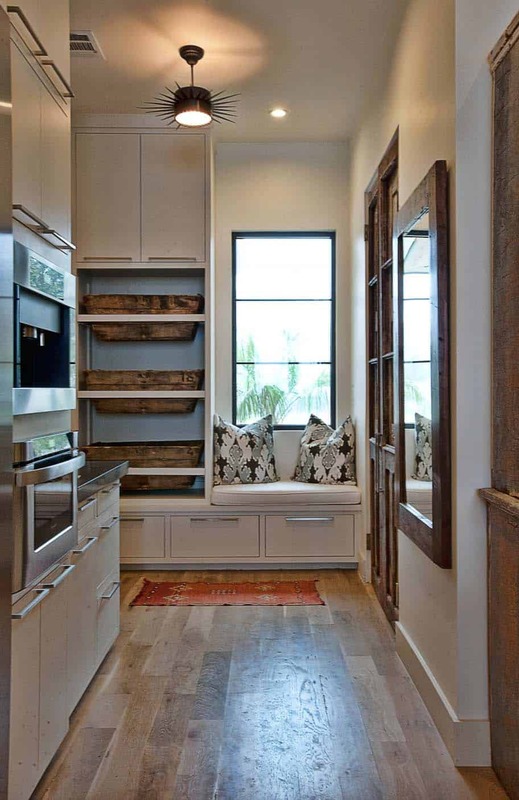 The kitchen is approximately 19’x12′, while this island is 7’4″ x 6’6″. 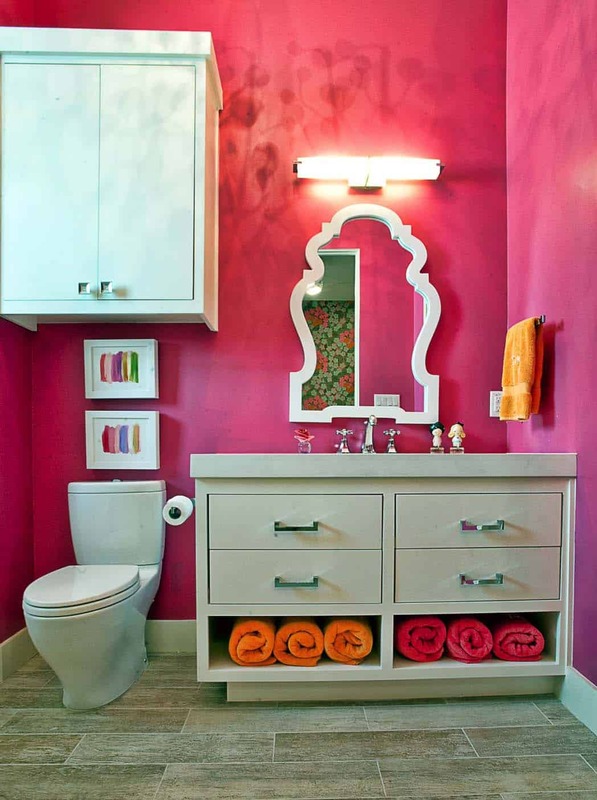 All plumbing fixtures are from KIVA kitchen and bath. 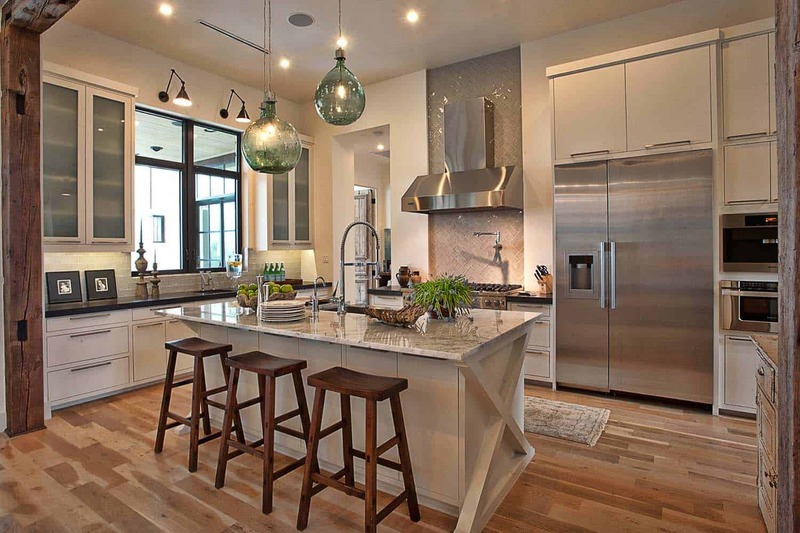 Above: The island countertop is Carrara Marble and the perimeter countertops are Caesarstone quartz. 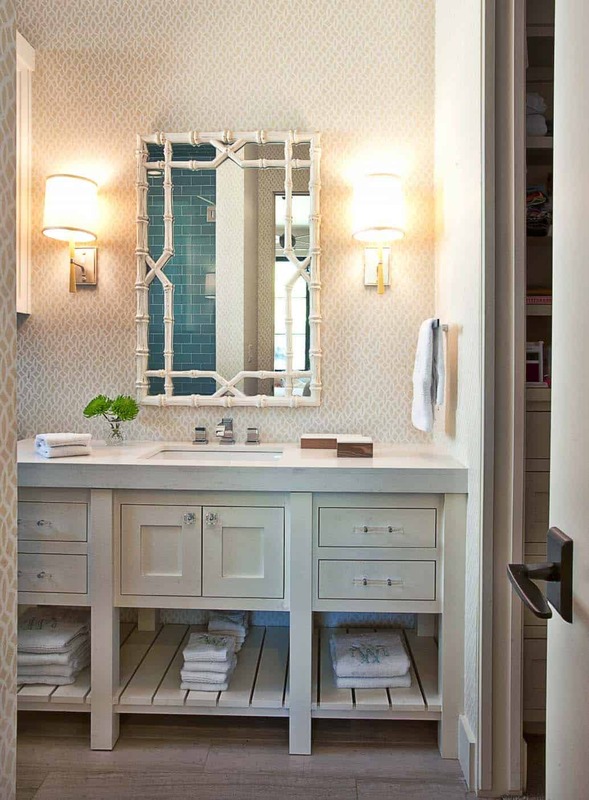 The backsplash above the range is a taupe glass subway tile laid on herringbone pattern. The hood and range are by Viking. The cabinets were done by Elegant Custom Cabinets. 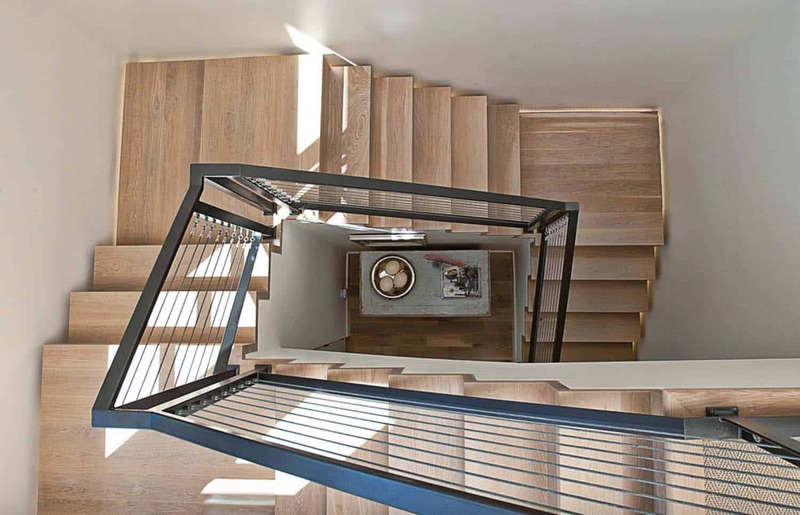 Above: The beautiful wood flooring throughout is solid hickory with a natural finish. 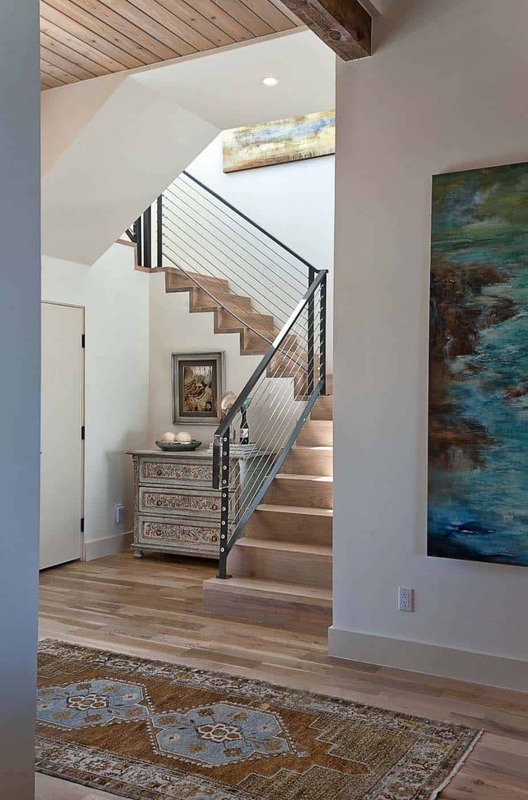 Since this project was a remodel, the existing floors were refurnished. 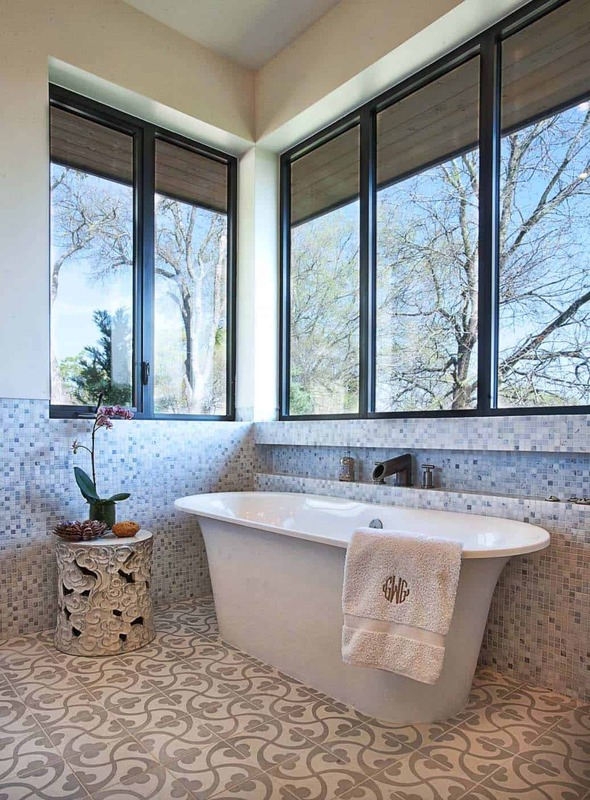 Above: The tile used on the pool and raised spa is Texas Limestone, check with Architectural Tile and Stone or The Tile Guys, they were the two suppliers for this house. 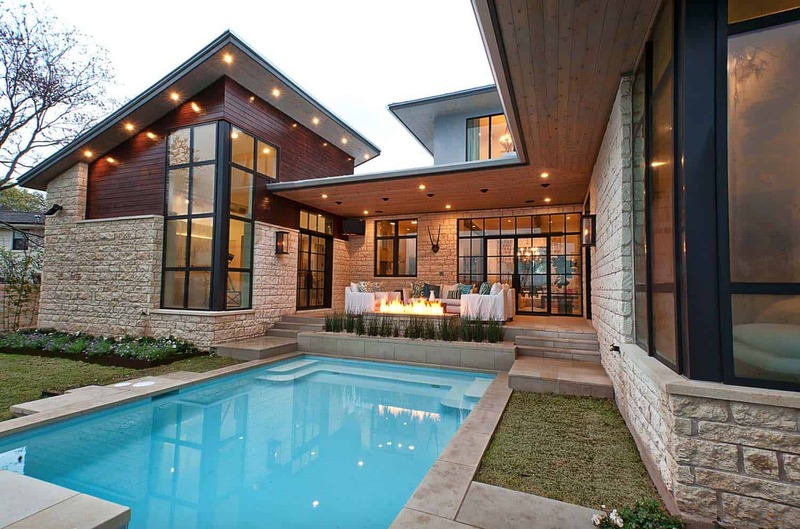 The pool is 14’x21 excluding the separate spa area. Above: The window manufacturer was Forjas Designs. The outdoor furnishings are Crate and Barrel Cataline/Regatta Lounge Set. 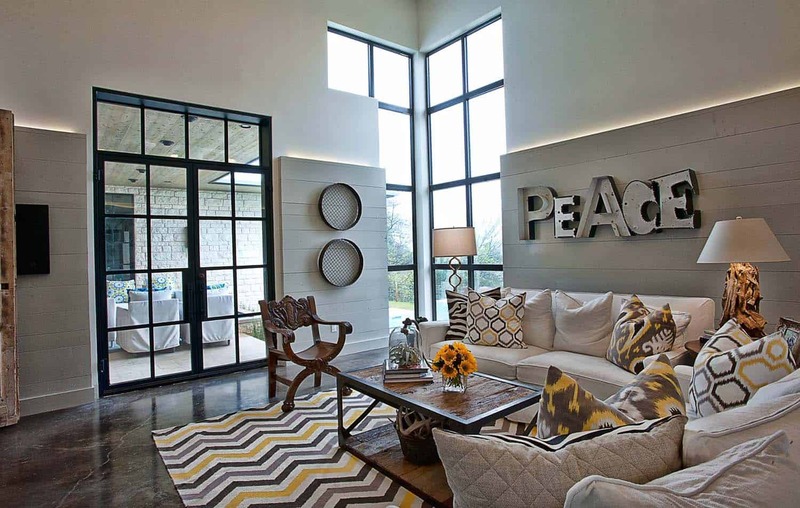 Above: The PEACE letters on the wall were found by the designer from the Round Top antiques fair in Texas. Above: The concrete flooring is a black kemiko stain — the black stain has a brownish hue mixed with black. 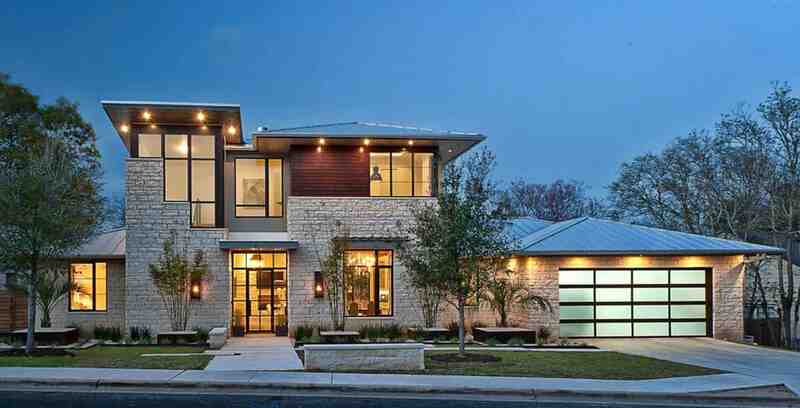 Above: The windows are from Texas Custom Windows. 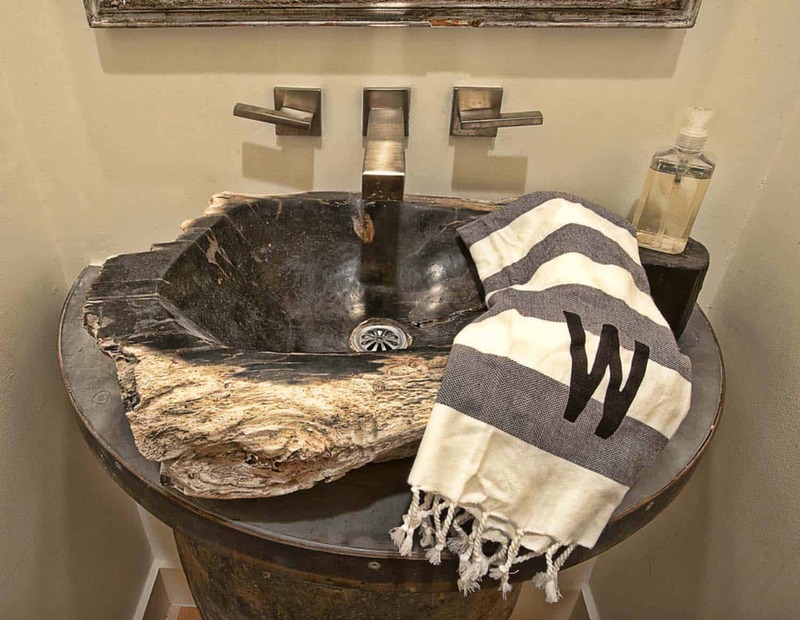 Above: In the powder bathroom, the hand towel is from West Elm. 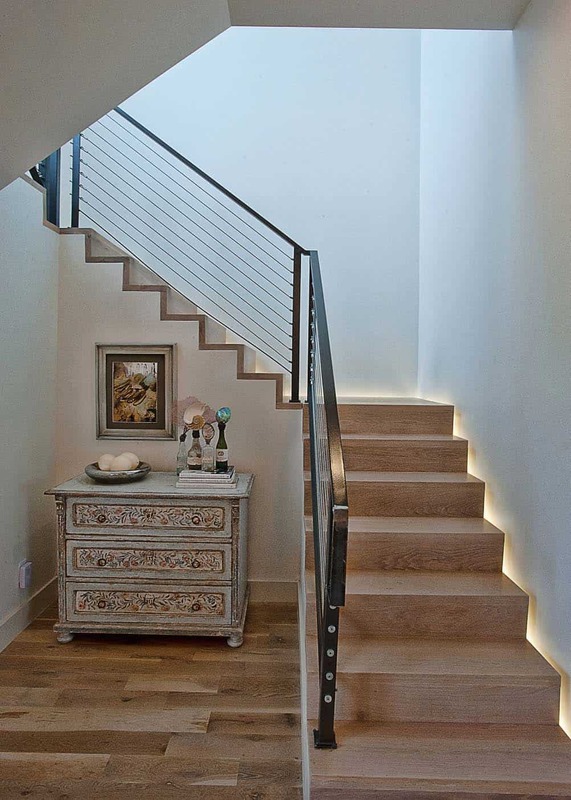 Above: The stairs were fabricated by Forja Designs with steel wire and custom hardware. 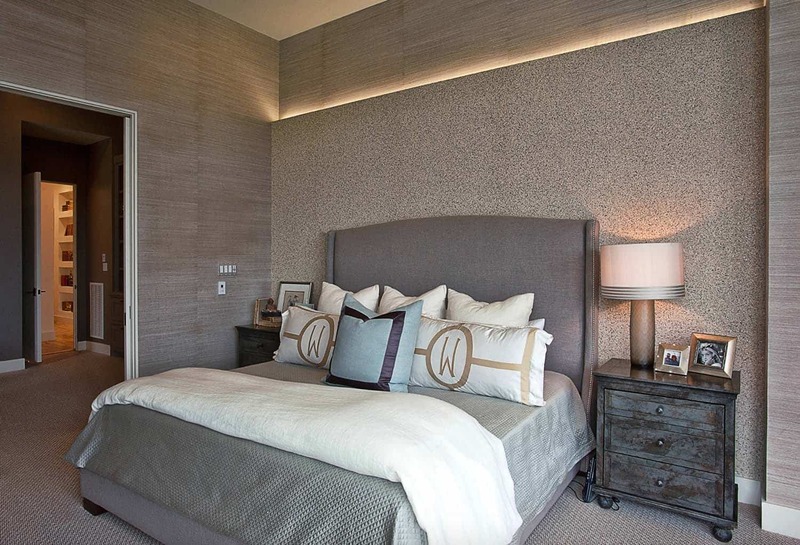 Above: In the master bedroom, the nightstands are from Restoration Hardware. The carpet in this home is from Prosource. 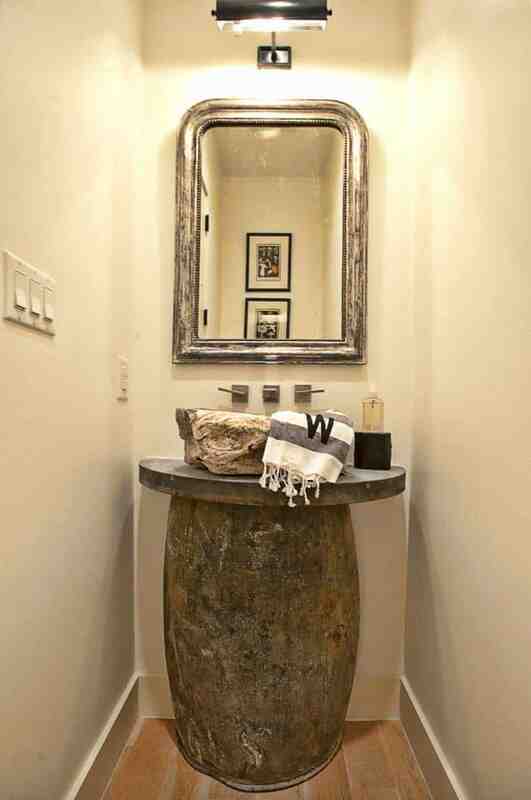 Above: Bathroom dimensions: 17′ 10″ x 8′ 8″. 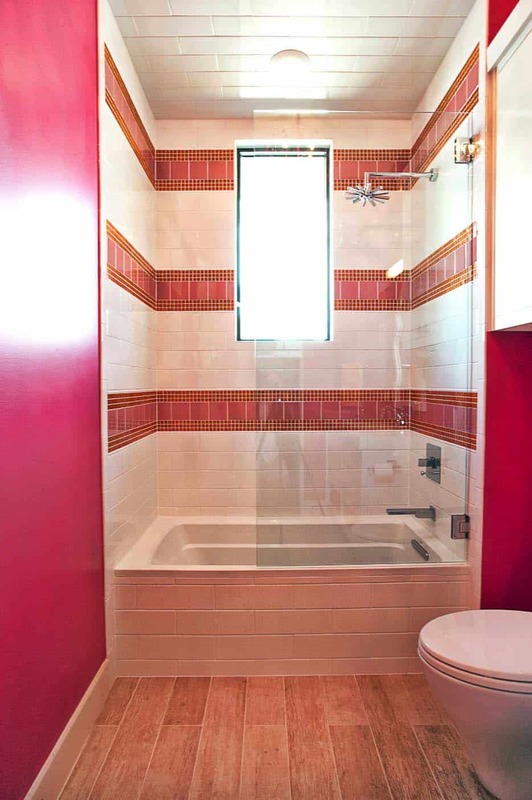 This home used two distributors for the tile: The Tile Guy and Architectural Tile and Stone. This tile can also be replicated from Villa Lagoon Tile, the name is Trebol 8″ and you can select from 60 different color options. 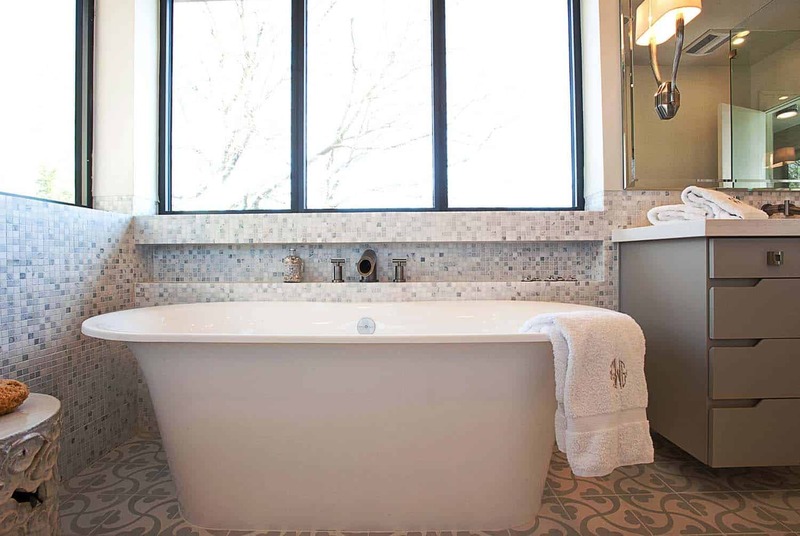 Above: The freestanding tub is from Victoria & Albert. 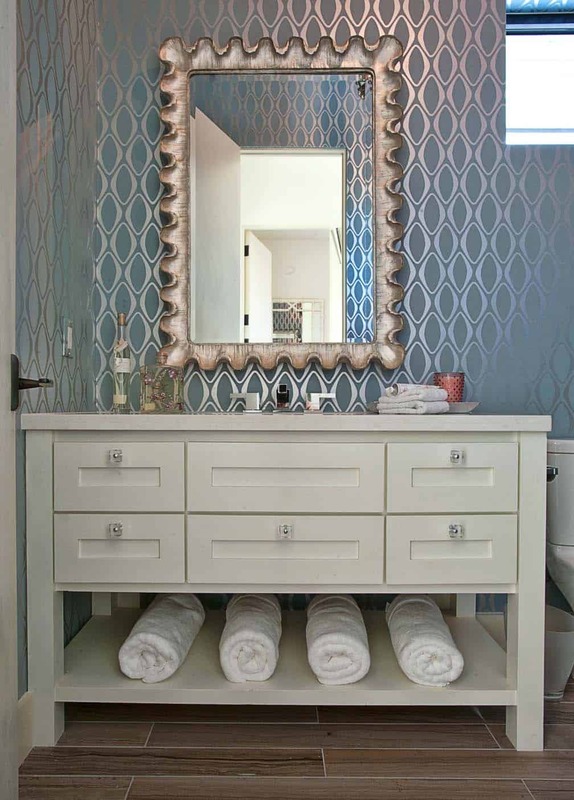 Above: The bathroom countertop is Livingstone Solid Surface. 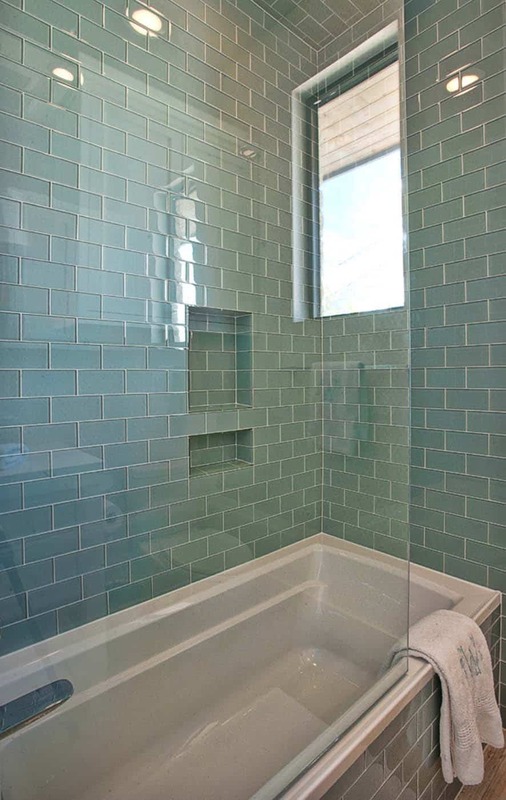 Above: In the bathtub/shower, the walls are clad in a glass subway tile. 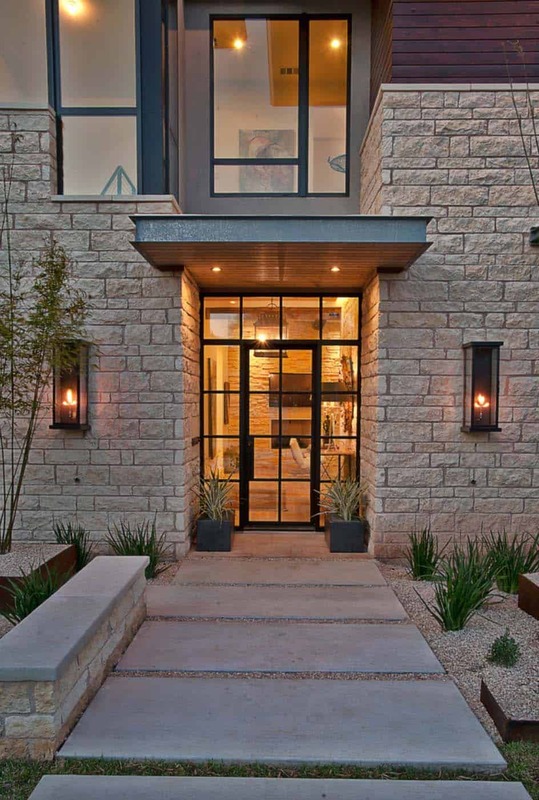 The exterior facade is a very popular look for this part of the country — using local masonry and wood that blends well with the area. 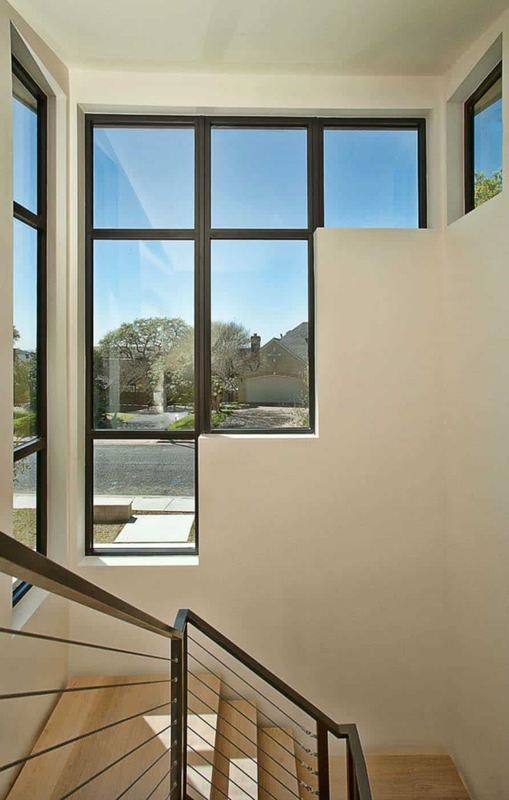 Large overhangs provide much-needed shade from the hot Texas sun and has enabled the architects to integrate more windows in the design. Pink and orange together should not be making a comeback. thanks for posting my home on your website :). 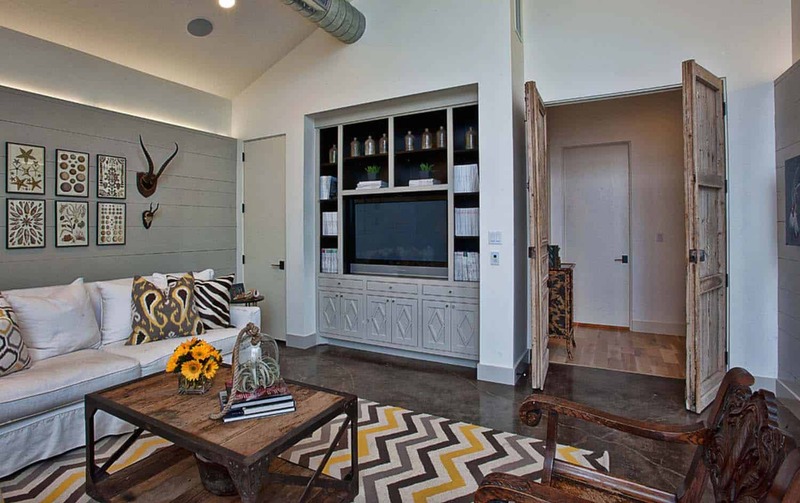 im an interior consultant in austin. fun to see it online!